Stages are raised, flat platforms that are commonly used for graduation ceremonies, school assemblies and putting on plays and other student performances. Seated Risers are sometimes similar to stages. You'll notice that many stage units can double as a seated riser. Other seated risers are built with tiered levels that are deep enough for chairs. 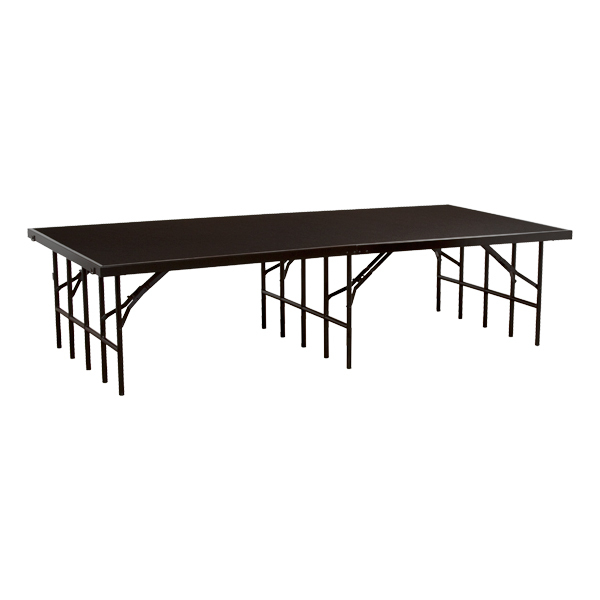 They are most often used for band concerts and other performances where students will remain seated. Standing Risers are similar to the tiered seated risers, but their levels aren't as deep. They provide enough room for students to stand during choir performances. Plywood - Most stage and riser decks are made of a solid plywood core with a standard hardboard laminate top and bottom. Plywood decks are quite durable and your most affordable choice. Aluminum decks are lightweight and rustproof, and usually carry a lifetime warranty. However, they're considerably more expensive. Hardboard Decks – A simple hardboard deck is the most economical, but adding carpet or polypropylene can be helpful in many situations. Polypropylene Decks – The polypropylene coating adds a durable, non-slip plastic surface to your stage or riser deck. Polypropylene decks are easy to clean and water resistant (though not entirely waterproof), which makes them perfect for outdoor assemblies and performances. Carpeted Decks – Carpet decks are covered in a short-pile, commercial-grade carpet, and are available in a variety of colors. Carpet is great because it dresses up your stages and risers, while also providing better sound absorption than non-carpeted decks. Carpeted decks are attractive and functional, but also slightly more expensive. You'll find that stage and riser decks are available in many sizes. In order to choose the size you need, you'll want to consider the size of the room and the number of people you'll need to accommodate. You'll also want to remember to leave ample room for steps to get on and off the stage, for adequate backstage room and for clear access to doors. Most stages and risers can be combined to handle nearly any size or configuration you require. Room Size – Typically, the bigger your room is, the higher you'll want your stage or riser to be so that people in the back of the room have a clear view of the performance. Ceiling Height – You want to be certain that your performers will have enough headroom. If your room has very low ceilings, you'll want to choose a stage that is lower to the ground. Performers – The age and height of your performers will also influence the height of your stage. Children and other small performers need higher stages in order to be seen from the back of the audience. Also, keep the age of your students in mind. If your stage is too high, it may be dangerous for very small children. 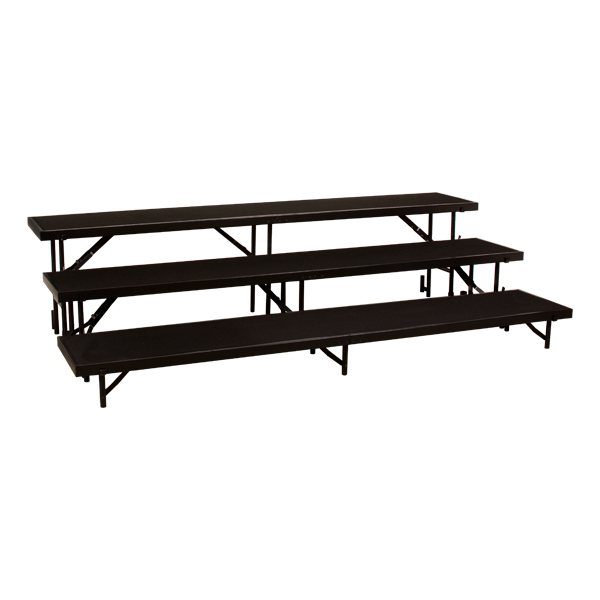 With choral risers, height depends upon the number of tiers you'll require. The more people in your choir, the more levels you need. Mobile Stages and Transfold Choral Risers – Mobile stages and Transfold Choral Risers feature built-in wheels, letting you fold them up and easily roll them from place to place. If your stages and risers will be taken down or moved around frequently, the additional cost of a mobile unit will likely be worth it. 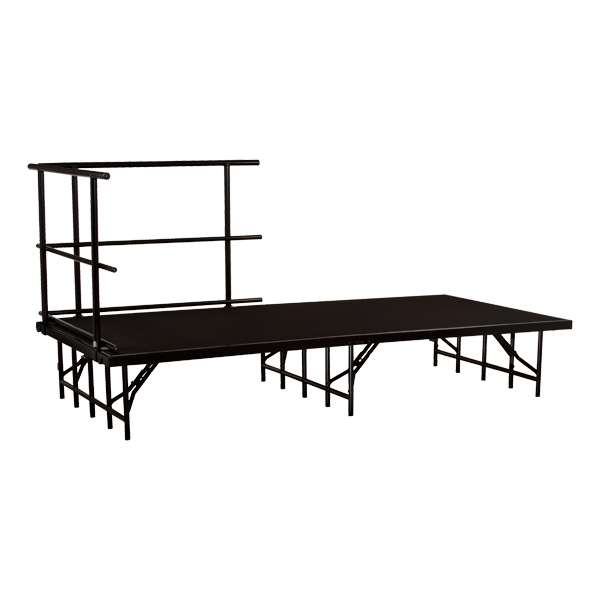 Portable Stages and Risers – Portable stages and risers fold up for easy storage and are easily moved from place to place on wheeled stage and riser caddies. 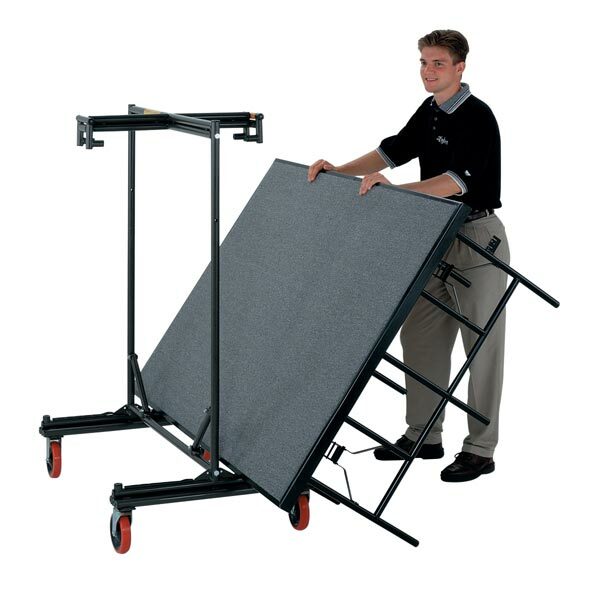 You'll find that portable stages and risers are slightly less expensive than mobile units. Steps – Steps are a good idea for stages and risers that are more than 8' high. You'll want to place one set of steps at each end of the stage for graduation commencements, plays and any event where students will be entering and exiting the stage from both sides. Handrails are included with most steps for additional safety. Guardrails – Guardrails are important for preventing accidents, especially if small children will be using your stages and risers. For choral risers, you'll want to make sure you purchase back guardrails, as well as side (sloping) guardrails to help children easily get on to and off of multi-tiered risers. 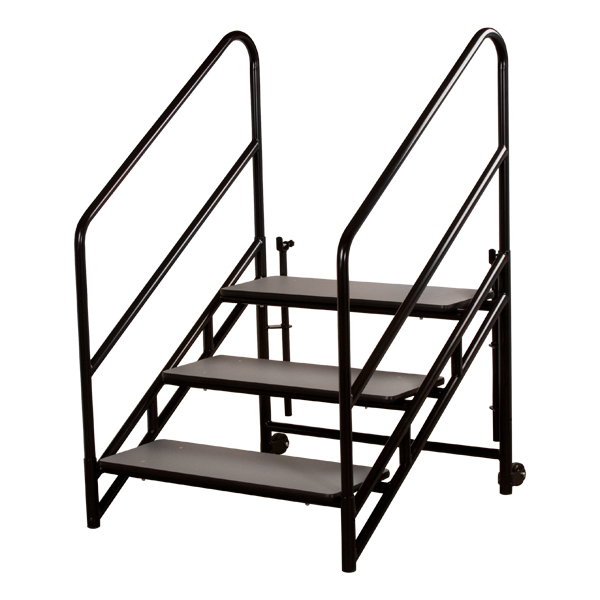 Stage and Riser Caddies – Stage and riser caddies are wheeled carts designed for moving and storing your stage and riser platforms. If your stage or riser set-up includes more than a few pieces, a caddy will save you a lot of work when setting up and tearing down. Stage Skirting – Stage skirting is essentially fabric that wraps around your stage to hide the legs and give it a finished look. 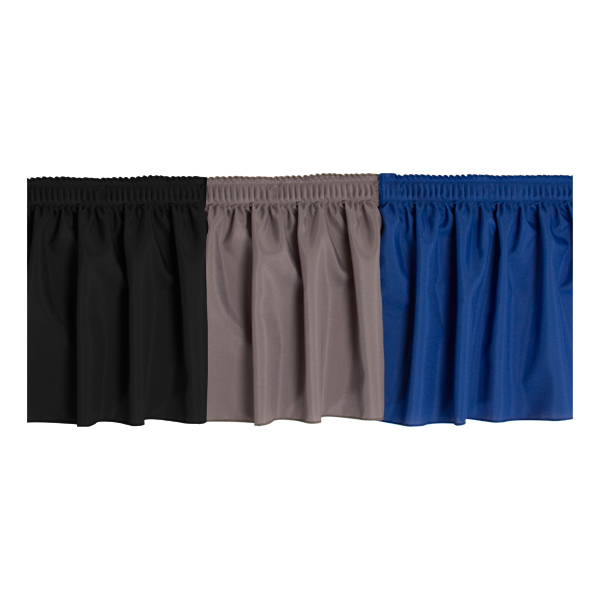 Stage skirting comes in either a shirred or box pleat style, and is available in a variety of colors. Skirting generally attaches to your stage with a hook-and-loop tape. Check out all of our portable stages. If you still have questions about choosing stages and risers for your school assemblies and performances, just give us a call at 1-800-260-2776. We're always happy to help you.